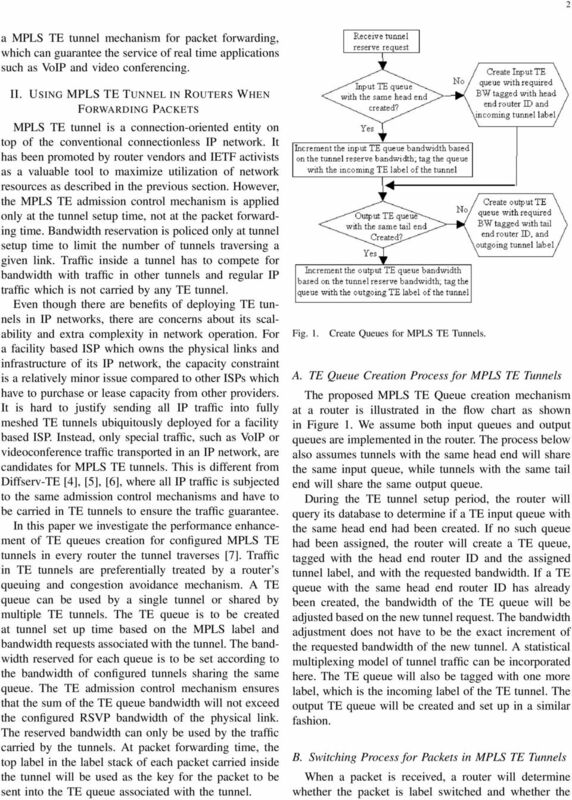 Download "Performance Analysis of MPLS TE Queues for QoS Routing"
5 5 . The performance is simulated and analyzed with a Generalized Processor Sharing (GPS) system. 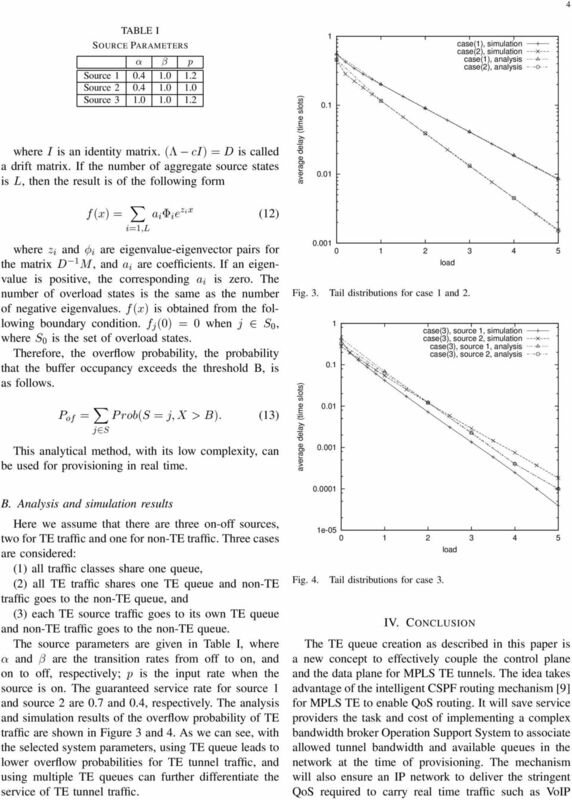 According to our results, using TE queues leads to lower overflow probabilities for TE tunnel traffic, and better QoS for real time traffic such as VoIP. In our future work, more complicated system models and traffic models will be considered by analysis and simulation. REFERENCES  D. Awduche, L. Berger, D. Gan, T. Li, V. Srinivasan, and G. Swallow, RFC3209, RSVP-TE: Extensions to RSVP for LSP Tunnels. D. Awduche, J. Malcolm, J. Agogbua, M. O Dell, and J. Mc- Manus, RFC 2702, Requirements for Traffic Engineering Over MPLS. Ping Pan, Der-Hwa Gan, George Swallow, Jean Phillippe Vasseur, Dave Cooper, Alia Atlas, Markus Jork, Fast Reroute Extensions to RSVP-TE for LSP Tunnels, draft-ietf-mpls-rsvplsp-fastreroute-00.txt. 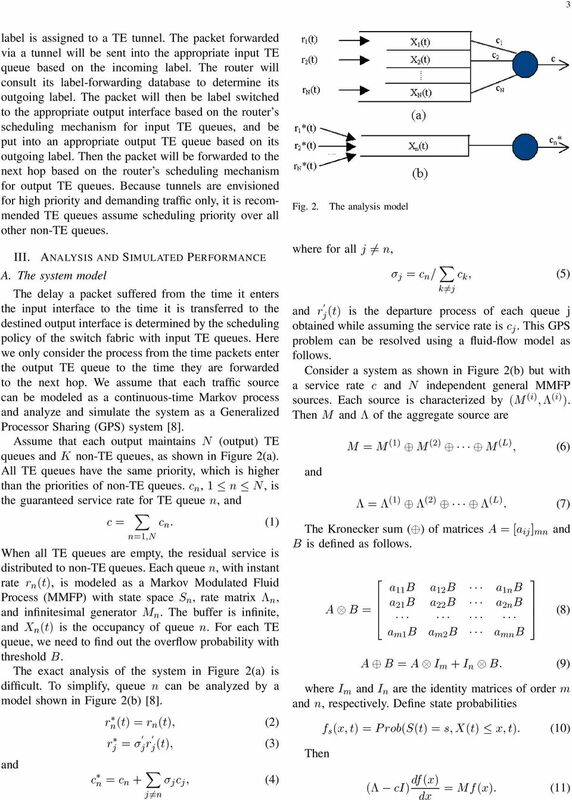 F. Le Faucheur (Editor), L. Wu, B. Davie, S. Davari, P. Vaananen, R. Krishnan, P. Cheval, and J. Heinanen, RFC 3270, Multi- Protocol Label Switching (MPLS) Support of Differentiated Services. Francois Le Faucheur and Waisum Lai, Requirements for support of Diff-Serv-aware MPLS Traffic Engineering, draft-ietftewg-diff-te-reqts-06.txt. 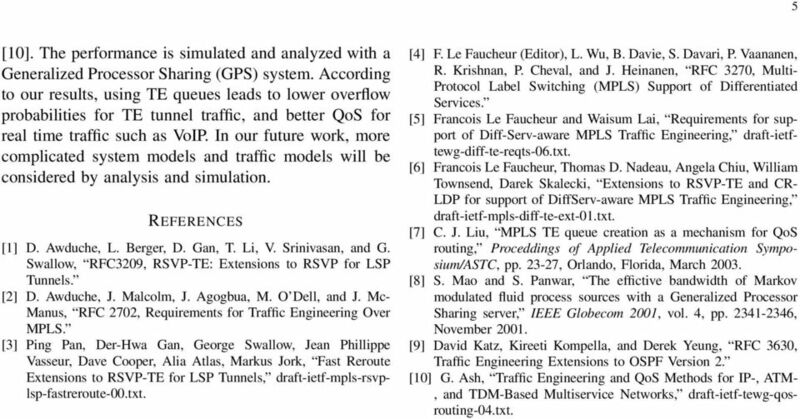 Francois Le Faucheur, Thomas D. Nadeau, Angela Chiu, William Townsend, Darek Skalecki, Extensions to RSVP-TE and CR- LDP for support of DiffServ-aware MPLS Traffic Engineering, draft-ietf-mpls-diff-te-ext-0.txt. C. J. Liu, MPLS TE queue creation as a mechanism for QoS routing, Proceddings of Applied Telecommunication Symposium/ASTC, pp , Orlando, Florida, March  S. Mao and S. Panwar, The effictive bandwidth of Markov modulated fluid process sources with a Generalized Processor Sharing server, IEEE Globecom 200, vol. 4, pp , November 200. David Katz, Kireeti Kompella, and Derek Yeung, RFC 3630, Traffic Engineering Extensions to OSPF Version 2. G. Ash, Traffic Engineering and QoS Methods for IP-, ATM-, and TDM-Based Multiservice Networks, draft-ietf-tewg-qosrouting-04.txt.